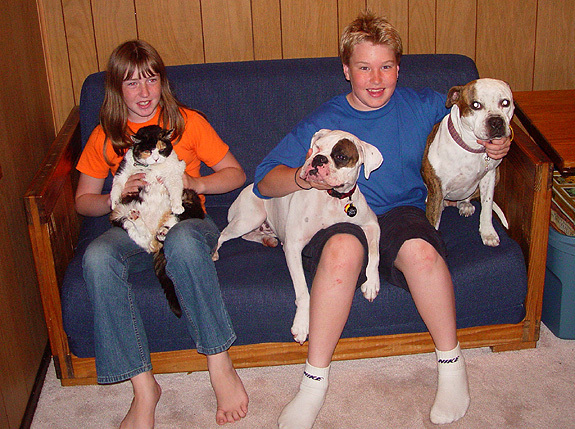 Here’s a photo of my kids and dogs: my pit bull, Brecken; my son, Drew; my other dog, Brooklyn; and my daughter, Morgan (she’s holding Winfrey, a calico that’s no longer with us). My wife and I are professionals in Boulder, Colo. She’s a human resources consultant, and I own a public relations firm. Brecken joined our family from the Boulder Valley Humane Society, as did Brooklyn a couple of years later. Since Brecken was a stray, they have no information on her background, but we all suspect some level of abuse. She’s afraid of the camera, so getting her to sit for photos isn’t always easy! Brooklyn, who is a very outgoing clown, has really helped Brecken come out of her shell. All of them have become treasured members of our family.